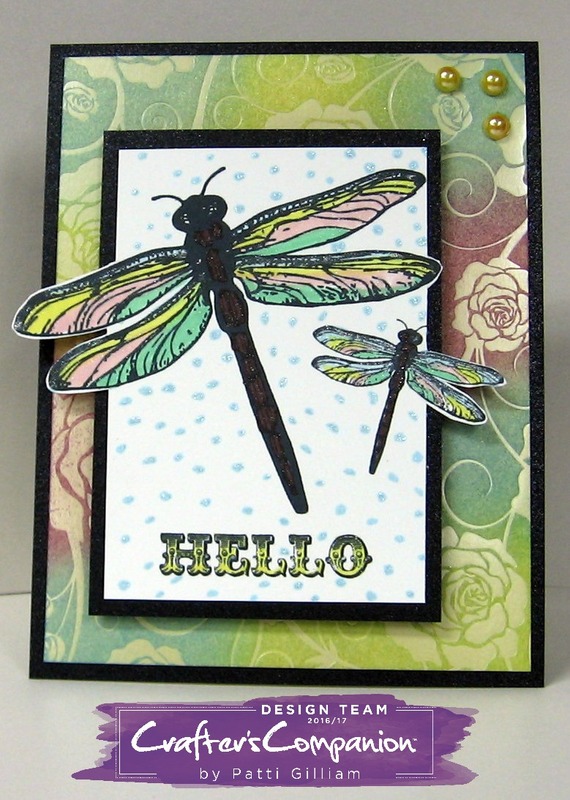 Oh I love how you used the dragon flies and the colors you used Patti. Patti ~ this is beautiful! Those dragonflies are so pretty and I love the background paper! This is gorgeous! LOVING the colors!!!!!!!!!!!!! The dragonflies are simply stunning - can't see the true sparkle but I know it is there. What a great job and I know that your little lady at church will surely be happy to receive this. Going to try and work in my craft room today - key word is "try". I love your beautiful card. That dragonfly design is gorgeous. And, so glad to hear your ice is melted too. What a beautiful card and I just had to PIN it. Love the way you coloured your dragonflies. The Hello has a wonderful font. This card will be loved for your friend. It looks like that pretty background was handmade. Beautiful card. Cards always look lovely in person. I am sure this just dazzles. Thanks for the inspiration. This is so pretty, Patti! The lady at church will love it! Very pretty card! I love your dragonfly! Lovely card, Patti. The dragonflies are stunning. Love the shimmer! Oh, how pretty Patti. Love those dragonflies... such pretty colors... and oh, that background. Great design.